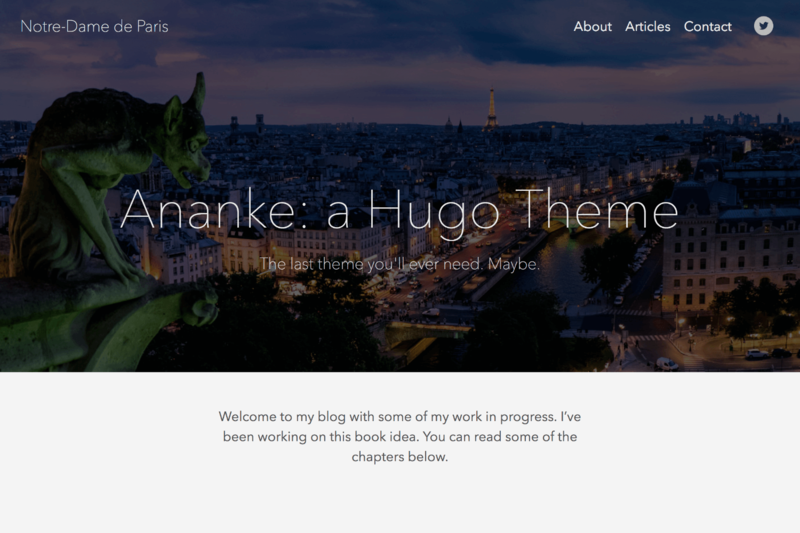 Ananke, A theme for Hugo, a framework for building websites. The intent of this theme is to provide a solid starting place for Hugo sites with basic features and include best practices for performance, accessibility, and rapid development. This theme uses the “Tachyons” CSS library. This will allow you to manipulate the design of the theme by changing class names in HTML without touching the original CSS files. For more information see the Tachyons website. After installing the theme successfully it requires a just a few more steps to get your site running. Take a look inside the exampleSite folder of this theme. You’ll find a file called config.toml. To use it, copy the config.toml in the root folder of your Hugo site. Feel free to change the strings in this theme. You may need to delete the line: themesDir = "../.."
To enable DISQUS comments, add disqusShortname = YOURSHORTNAME to your config file. If you would like to hide the header text on the featured image on a page, set omit_header_text to true. See exampleSite/content/contact.md for an example. example: background_color_class = "bg-blue" or background_color_class = "bg-gray"
You can find a list of available typefaces here. And a list of background colors here. n.b. in future versions we will likely separate the typeface and other body classes. You can override the built-in css by using your own. Just put your own css files in the static directory of your website (the one in the theme directory also works but is not recommended) and modify the custom_css parameter in your config file. The path referenced in the parameter should be relative to the static folder. These css files will be added through the header partial after the built-in css file. If you add a key of show_reading_time true to either the Config Params, a page or section’s front matter, articles will show the reading time and word count. If you find a bug or have an idea for a feature, feel free to use the issue tracker to let me know.